I believe in chruch growth because PEOPLE NEED THE LORD. The Bible is clear about the ultimate doom of unbelievers. “…Depart from me, ye cursed, into everlasting fire, prepared for the devil and his angels: And these shall go away into everlasting punishment… (Matt. 25:41, 46). 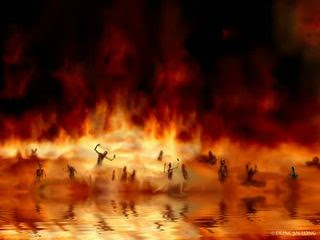 And whosoever was not found written in the book of life was cast into the lake of fire” (Rev. 20:15). This is a reality we cannot ignore. The consequences are too great. People perish without God. People you know will die lost and spend eternity in a blistering blast furnace of eternal anguish if they don’t have eternal life. We cannot concern ourselves with trivial matters like getting our favorite seat or the same parking place at church each week as long as there are people (who we know) that need God. This task of reaching lost people is greater than anything else you could do with your life. It is the very reason Jesus came to die. Lost people matter to God and therefore they should matter to us. The urgency of reaching the lost is illustrated in the parable of the ninety nine sheep (Luke 15:1-7). Jesus said if a shepherd counts 99 sheep and discovers one is missing, he will leave the flock to search for the one which is lost. Instead of staying with the flock and grooming the ninety nine (yet one more time) it is better to go out and search for one more. Heaven is a lot happier when one sinner repents than they are when a church focuses only on itself, maintaining the ninety nine. Suppose I found the cure for cancer. Think of how wonderful that would be for humanity. But instead of sharing it with as many people as possible, I only shared the cure with a small private club of people whom I happen to like. That would be the most unloving, selfish, and criminal thing I could do. Yet, that’s exactly what churches do when they keep the good news to themselves and are not willing to share with those outside the flock. They are willing to let people go to hell without even making an effort to intercede. It is criminal. The most UNSELFISH thing a church could do is to MAKE THE CONSCIOUS DECISION TO GROW. Why? Because putting the needs other others above your own is the very essence of Christianity and servanthood. Growth means change… new people… someone else getting your seat… different ideas… more demands being placed upon church workers… and not having the same access to the pastor as you once had. But none of that should matter because PEOPLE NEED THE LORD. Friends don't let friends go to hell.